Situation: Passing off fabric as hardware to the Man of The House (MOTH). Success rate: Clearly a high risk, but potentially high return strategy. Hinges on whether the MOTH subscribes to the if-it-looks-like-a-duck-and-sounds-like-a-duck philosophy. Regarding the example above, I have only one thing to say: quack, quack. I can't wait for more justifications, as I'm rapidly running out of storage space, and my usual vague excuse that "It's for an experiment" coupled with a sage head nod seems to be wearing thin these days. quack ;) I don't see any fabric. You are, quite simply, my hero. I'm so tempted to buy some of that chalkboard cloth...it looks amazing. I just have to work out WHY I need it. I'm with Nikki... 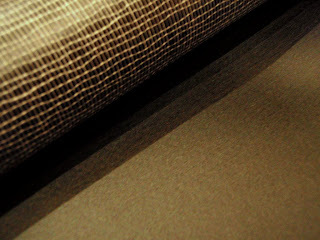 I've been lusting after chalkboard cloth too although I have absolutely no reason to need any! Ooh, very risky. But definately worth a try! Bring on the justifications! I'm dying to see what you make with this. WOW did not know about this till I read this post! COOL. Do tell show us what you do with it. I just bought some of this recently! Can't wait to see what you get up to with it. I am definitely waddling to the Chalkboard shop. Yes , well , allow me to help you with the justification process ! Does MOTH ever complain that you forgot to buy something at the market? Just ask MOTH to quickly jot it down on your new noticeboard to remind you !